All batch processing can be described in its most simple form as reading in large amounts of data, performing some type of calculation or transformation, and writing the result out. Spring Batch provides three key interfaces to help perform bulk reading and writing: ItemReader, ItemProcessor, and ItemWriter. Flat File: Flat-file item readers read lines of data from a flat file that typically describes records with fields of data defined by fixed positions in the file or delimited by some special character (such as a comma). XML: XML ItemReaders process XML independently of technologies used for parsing, mapping and validating objects. 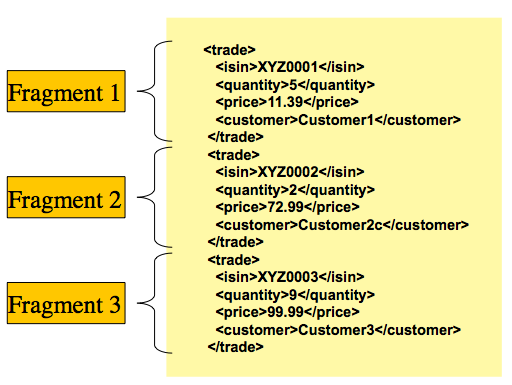 Input data allows for the validation of an XML file against an XSD schema. Database: A database resource is accessed to return resultsets which can be mapped to objects for processing. The default SQL ItemReader implementations invoke a RowMapper to return objects, keep track of the current row if restart is required, store basic statistics, and provide some transaction enhancements that are explained later. There are many more possibilities, but we focus on the basic ones for this chapter. A complete list of all available ItemReader implementations can be found in Appendix A. The read method defines the most essential contract of the ItemReader. Calling it returns one item or null if no more items are left. An item might represent a line in a file, a row in a database, or an element in an XML file. It is generally expected that these are mapped to a usable domain object (such as Trade, Foo, or others), but there is no requirement in the contract to do so. It is expected that implementations of the ItemReader interface are forward only. However, if the underlying resource is transactional (such as a JMS queue) then calling read may return the same logical item on subsequent calls in a rollback scenario. It is also worth noting that a lack of items to process by an ItemReader does not cause an exception to be thrown. For example, a database ItemReader that is configured with a query that returns 0 results returns null on the first invocation of read. ItemWriter is similar in functionality to an ItemReader but with inverse operations. Resources still need to be located, opened, and closed but they differ in that an ItemWriter writes out, rather than reading in. In the case of databases or queues, these operations may be inserts, updates, or sends. The format of the serialization of the output is specific to each batch job. As with read on ItemReader, write provides the basic contract of ItemWriter. It attempts to write out the list of items passed in as long as it is open. Because it is generally expected that items are 'batched' together into a chunk and then output, the interface accepts a list of items, rather than an item by itself. After writing out the list, any flushing that may be necessary can be performed before returning from the write method. For example, if writing to a Hibernate DAO, multiple calls to write can be made, one for each item. The writer can then call flush on the hibernate session before returning. One typical use for an item processor is to filter out records before they are passed to the ItemWriter. Filtering is an action distinct from skipping. Skipping indicates that a record is invalid, while filtering simply indicates that a record should not be written. For example, consider a batch job that reads a file containing three different types of records: records to insert, records to update, and records to delete. If record deletion is not supported by the system, then we would not want to send any "delete" records to the ItemWriter. But, since these records are not actually bad records, we would want to filter them out rather than skip them. As a result, the ItemWriter would receive only "insert" and "update" records. To filter a record, you can return null from the ItemProcessor. The framework detects that the result is null and avoids adding that item to the list of records delivered to the ItemWriter. As usual, an exception thrown from the ItemProcessor results in a skip. When a chunk is rolled back, items that have been cached during reading may be reprocessed. If a step is configured to be fault tolerant (typically by using skip or retry processing), any ItemProcessor used should be implemented in a way that is idempotent. Typically that would consist of performing no changes on the input item for the ItemProcessor and only updating the instance that is the result. Before describing each method, we should mention the ExecutionContext. Clients of an ItemReader that also implement ItemStream should call open before any calls to read, in order to open any resources such as files or to obtain connections. A similar restriction applies to an ItemWriter that implements ItemStream. As mentioned in Chapter 2, if expected data is found in the ExecutionContext, it may be used to start the ItemReader or ItemWriter at a location other than its initial state. Conversely, close is called to ensure that any resources allocated during open are released safely. update is called primarily to ensure that any state currently being held is loaded into the provided ExecutionContext. This method is called before committing, to ensure that the current state is persisted in the database before commit. In the special case where the client of an ItemStream is a Step (from the Spring Batch Core), an ExecutionContext is created for each StepExecution to allow users to store the state of a particular execution, with the expectation that it is returned if the same JobInstance is started again. For those familiar with Quartz, the semantics are very similar to a Quartz JobDataMap. One of the most common mechanisms for interchanging bulk data has always been the flat file. Unlike XML, which has an agreed upon standard for defining how it is structured (XSD), anyone reading a flat file must understand ahead of time exactly how the file is structured. In general, all flat files fall into two types: delimited and fixed length. Delimited files are those in which fields are separated by a delimiter, such as a comma. Fixed Length files have fields that are a set length. There are many more options on the FieldSet interface, such as Date, long, BigDecimal, and so on. The biggest advantage of the FieldSet is that it provides consistent parsing of flat file input. Rather than each batch job parsing differently in potentially unexpected ways, it can be consistent, both when handling errors caused by a format exception, or when doing simple data conversions. In complex batch environments, the directory structures are often managed by the EAI infrastructure, where drop zones for external interfaces are established for moving files from FTP locations to batch processing locations and vice versa. 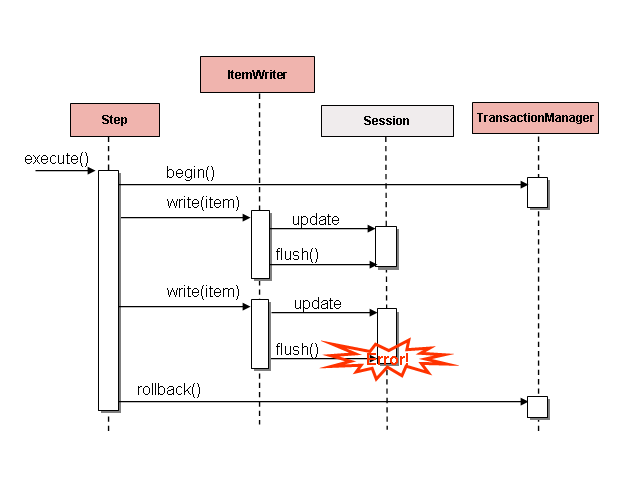 File moving utilities are beyond the scope of the Spring Batch architecture, but it is not unusual for batch job streams to include file moving utilities as steps in the job stream. The batch architecture only needs to know how to locate the files to be processed. Spring Batch begins the process of feeding the data into the pipe from this starting point. However, Spring Integration provides many of these types of services. Specifies line prefixes that indicate comment rows. Specifies what text encoding to use. The default is the value of Charset.defaultCharset(). Converts a String to an Object representing the item. Number of lines to ignore at the top of the file. Used to determine where the line endings are and do things like continue over a line ending if inside a quoted string. The resource from which to read. Interface that passes the raw line content of the lines in the file to be skipped. If linesToSkip is set to 2, then this interface is called twice. In strict mode, the reader throws an exception on ExecutionContext if the input resource does not exist. Otherwise, it logs the problem and continues. The basic contract is that, given the current line and the line number with which it is associated, the mapper should return a resulting domain object. This is similar to RowMapper, in that each line is associated with its line number, just as each row in a ResultSet is tied to its row number. This allows the line number to be tied to the resulting domain object for identity comparison or for more informative logging. However, unlike RowMapper, the LineMapper is given a raw line which, as discussed above, only gets you halfway there. The line must be tokenized into a FieldSet, which can then be mapped to an object, as described later in this document. DelimitedLineTokenizer: Used for files where fields in a record are separated by a delimiter. The most common delimiter is a comma, but pipes or semicolons are often used as well. FixedLengthTokenizer: Used for files where fields in a record are each a "fixed width". The width of each field must be defined for each record type. PatternMatchingCompositeLineTokenizer: Determines which LineTokenizer among a list of tokenizers should be used on a particular line by checking against a pattern. The pattern used is the same as the RowMapper used by JdbcTemplate. Read one line from the file. Pass the String line into the LineTokenizer#tokenize() method to retrieve a FieldSet. Pass the FieldSet returned from tokenizing to a FieldSetMapper, returning the result from the ItemReader#read() method. The above functionality is provided in a default implementation, rather than being built into the reader itself (as was done in previous versions of the framework) to allow users greater flexibility in controlling the parsing process, especially if access to the raw line is needed. Each call to read returns a new Player object from each line in the file. When the end of the file is reached, null is returned. For each entry in the FieldSet, the mapper looks for a corresponding setter on a new instance of the Player object (for this reason, prototype scope is required) in the same way the Spring container looks for setters matching a property name. Each available field in the FieldSet is mapped, and the resultant Player object is returned, with no code required. ISIN: Unique identifier for the item being ordered - 12 characters long. Quantity: Number of the item being ordered - 3 characters long. Price: Price of the item - 5 characters long. Customer: ID of the customer ordering the item - 9 characters long. Because the FixedLengthLineTokenizer uses the same LineTokenizer interface as discussed above, it returns the same FieldSet as if a delimiter had been used. This allows the same approaches to be used in handling its output, such as using the BeanWrapperFieldSetMapper. Supporting the above syntax for ranges requires that a specialized property editor, RangeArrayPropertyEditor, be configured in the ApplicationContext. However, this bean is automatically declared in an ApplicationContext where the batch namespace is used. Because the FixedLengthLineTokenizer uses the same LineTokenizer interface as discussed above, it returns the same FieldSet as if a delimiter had been used. This lets the same approaches be used in handling its output, such as using the BeanWrapperFieldSetMapper. In this file we have three types of records, "USER", "LINEA", and "LINEB". A "USER" line corresponds to a User object. "LINEA" and "LINEB" both correspond to Line objects, though a "LINEA" has more information than a "LINEB". In this example, "LINEA" and "LINEB" have separate LineTokenizer instances, but they both use the same FieldSetMapper. The PatternMatchingCompositeLineMapper uses the PatternMatcher#match method in order to select the correct delegate for each line. The PatternMatcher allows for two wildcard characters with special meaning: the question mark ("?") matches exactly one character, while the asterisk ("*") matches zero or more characters. Note that, in the preceding configuration, all patterns end with an asterisk, making them effectively prefixes to lines. The PatternMatcher always matches the most specific pattern possible, regardless of the order in the configuration. So if "LINE*" and "LINEA*" were both listed as patterns, "LINEA" would match pattern "LINEA*", while "LINEB" would match pattern "LINE*". Additionally, a single asterisk ("*") can serve as a default by matching any line not matched by any other pattern, as shown in the following example. There is also a PatternMatchingCompositeLineTokenizer that can be used for tokenization alone. It is also common for a flat file to contain records that each span multiple lines. To handle this situation, a more complex strategy is required. A demonstration of this common pattern can be found in the multiLineRecords sample. There are many scenarios when tokenizing a line may cause exceptions to be thrown. Many flat files are imperfect and contain incorrectly formatted records. Many users choose to skip these erroneous lines while logging the issue, the original line, and the line number. These logs can later be inspected manually or by another batch job. For this reason, Spring Batch provides a hierarchy of exceptions for handling parse exceptions: FlatFileParseException and FlatFileFormatException. FlatFileParseException is thrown by the FlatFileItemReader when any errors are encountered while trying to read a file. FlatFileFormatException is thrown by implementations of the LineTokenizer interface and indicates a more specific error encountered while tokenizing. Because the tokenizer was configured with 4 column names but only 3 tokens were found in the file, an IncorrectTokenCountException was thrown. The preceding example is almost identical to the one before it, except that tokenizer.setStrict(false) was called. This setting tells the tokenizer to not enforce line lengths when tokenizing the line. A FieldSet is now correctly created and returned. However, it contains only empty tokens for the remaining values. Writing out to flat files has the same problems and issues that reading in from a file must overcome. A step must be able to write either delimited or fixed length formats in a transactional manner. The LineAggregator is the logical opposite of LineTokenizer. LineTokenizer takes a String and returns a FieldSet, whereas LineAggregator takes an item and returns a String. The preceding implementation is useful if direct control of creating the string is required but the advantages of a FlatFileItemWriter, such as transaction and restart support, are necessary. The object to be written is passed to the LineAggregator in order to obtain a String. The returned String is written to the configured file. Pass the line into the LineTokenizer#tokenize() method, in order to retrieve a FieldSet. Pass the item to be written to the writer. Convert the fields on the item into an array. Aggregate the resulting array into a line. Implementations of the FieldExtractor interface should create an array from the fields of the provided object, which can then be written out with a delimiter between the elements or as part of a fixed-width line. There are many cases where a collection, such as an array, Collection, or FieldSet, needs to be written out. "Extracting" an array from one of these collection types is very straightforward. To do so, convert the collection to an array. Therefore, the PassThroughFieldExtractor should be used in this scenario. It should be noted that, if the object passed in is not a type of collection, then the PassThroughFieldExtractor returns an array containing solely the item to be extracted. This extractor implementation has only one required property: the names of the fields to map. Just as the BeanWrapperFieldSetMapper needs field names to map fields on the FieldSet to setters on the provided object, the BeanWrapperFieldExtractor needs names to map to getters for creating an object array. It is worth noting that the order of the names determines the order of the fields within the array. In the previous example, the BeanWrapperFieldExtractor described earlier in this chapter is used to turn the name and credit fields within CustomerCredit into an object array, which is then written out with commas between each field. The underlying implementation is built using the same Formatter added as part of Java 5. The Java Formatter is based on the printf functionality of the C programming language. Most details on how to configure a formatter can be found in the Javadoc of Formatter. FlatFileItemReader has a very simple relationship with file resources. When the reader is initialized, it opens the file (if it exists), and throws an exception if it does not. File writing isn’t quite so simple. At first glance, it seems like a similar straightforward contract should exist for FlatFileItemWriter: If the file already exists, throw an exception, and, if it does not, create it and start writing. However, potentially restarting a Job can cause issues. In normal restart scenarios, the contract is reversed: If the file exists, start writing to it from the last known good position, and, if it does not, throw an exception. However, what happens if the file name for this job is always the same? In this case, you would want to delete the file if it exists, unless it’s a restart. Because of this possibility, the FlatFileItemWriter contains the property, shouldDeleteIfExists. Setting this property to true causes an existing file with the same name to be deleted when the writer is opened. 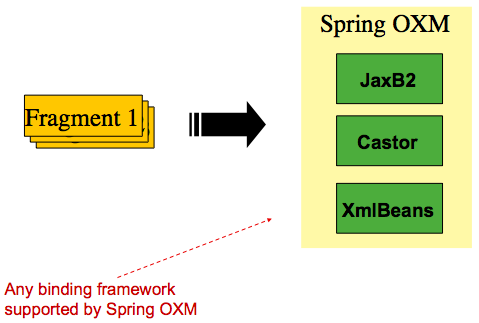 Spring Batch provides transactional infrastructure for both reading XML records and mapping them to Java objects as well as writing Java objects as XML records. The StAX API is used for I/O, as other standard XML parsing APIs do not fit batch processing requirements (DOM loads the whole input into memory at once and SAX controls the parsing process by allowing the user to provide only callbacks). With an introduction to OXM and how one can use XML fragments to represent records, we can now more closely examine readers and writers. Root Element Name: The name of the root element of the fragment that constitutes the object to be mapped. The example configuration demonstrates this with the value of trade. Resource: A Spring Resource that represents the file to be read. Unmarshaller: An unmarshalling facility provided by Spring OXM for mapping the XML fragment to an object. The following example shows how to define a StaxEventItemReader that works with a root element named trade, a resource of org/springframework/batch/item/xml/domain/trades.xml, and an unmarshaller called tradeMarshaller. On input, the reader reads the XML resource until it recognizes that a new fragment is about to start. By default, the reader matches the element name to recognize that a new fragment is about to start. The reader creates a standalone XML document from the fragment and passes the document to a deserializer (typically a wrapper around a Spring OXM Unmarshaller) to map the XML to a Java object. The referenced delegate is a simple FlatFileItemReader. The above configuration reads input from both files, handling rollback and restart scenarios. It should be noted that, as with any ItemReader, adding extra input (in this case a file) could cause potential issues when restarting. It is recommended that batch jobs work with their own individual directories until completed successfully. Input resources are ordered by using MultiResourceItemReader#setComparator(Comparator) to make sure resource ordering is preserved between job runs in restart scenario. Using a database cursor is generally the default approach of most batch developers, because it is the database’s solution to the problem of 'streaming' relational data. The Java ResultSet class is essentially an object oriented mechanism for manipulating a cursor. A ResultSet maintains a cursor to the current row of data. Calling next on a ResultSet moves this cursor to the next row. The Spring Batch cursor-based ItemReader implementation opens a cursor on initialization and moves the cursor forward one row for every call to read, returning a mapped object that can be used for processing. The close method is then called to ensure all resources are freed up. The Spring core JdbcTemplate gets around this problem by using the callback pattern to completely map all rows in a ResultSet and close before returning control back to the method caller. However, in batch, this must wait until the step is complete. The following image shows a generic diagram of how a cursor-based ItemReader works. 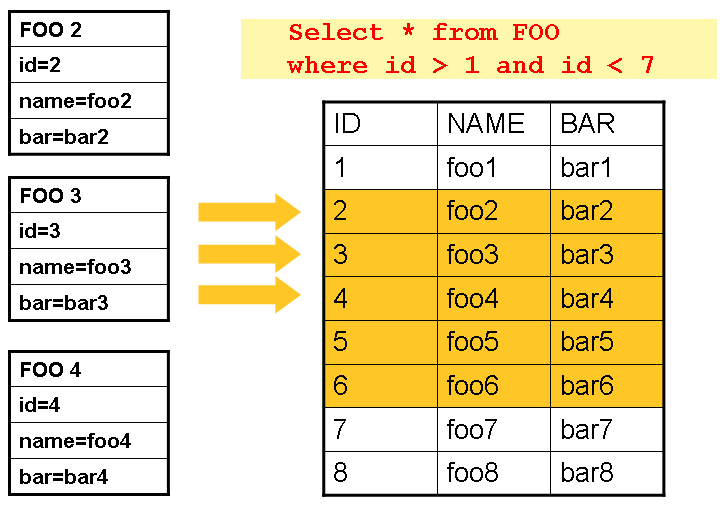 Note that, while the example uses SQL (because SQL is so widely known), any technology could implement the basic approach. This example illustrates the basic pattern. Given a 'FOO' table, which has three columns: ID, NAME, and BAR, select all rows with an ID greater than 1 but less than 7. This puts the beginning of the cursor (row 1) on ID 2. The result of this row should be a completely mapped Foo object. Calling read() again moves the cursor to the next row, which is the Foo with an ID of 3. The results of these reads are written out after each read, allowing the objects to be garbage collected (assuming no instance variables are maintaining references to them). Determines whether or not SQLWarnings are logged or cause an exception. The default is true (meaning that warnings are logged). Gives the JDBC driver a hint as to the number of rows that should be fetched from the database when more rows are needed by the ResultSet object used by the ItemReader. By default, no hint is given. Sets the limit for the maximum number of rows the underlying ResultSet can hold at any one time. Sets the number of seconds the driver waits for a Statement object to run. If the limit is exceeded, a DataAccessException is thrown. (Consult your driver vendor documentation for details). Because the same ResultSet held by the ItemReader is passed to the RowMapper, it is possible for users to call ResultSet.next() themselves, which could cause issues with the reader’s internal count. Setting this value to true causes an exception to be thrown if the cursor position is not the same after the RowMapper call as it was before. Indicates whether or not the reader’s state should be saved in the ExecutionContext provided by ItemStream#update(ExecutionContext). The default is true. Indicates whether the JDBC driver supports setting the absolute row on a ResultSet. It is recommended that this is set to true for JDBC drivers that support ResultSet.absolute(), as it may improve performance, especially if a step fails while working with a large data set. Defaults to false. Indicates whether the connection used for the cursor should be used by all other processing, thus sharing the same transaction. 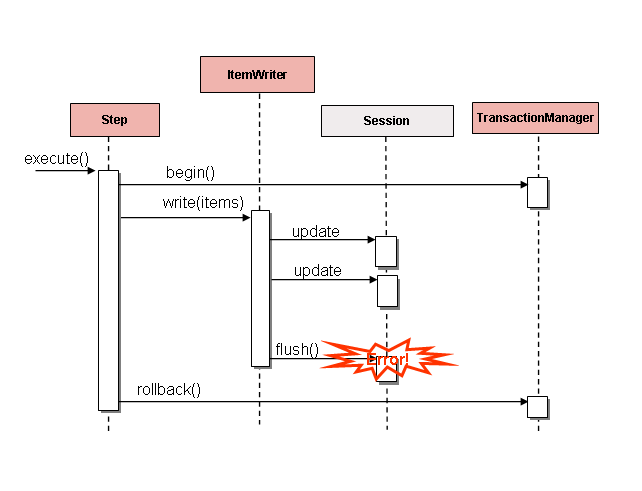 If this is set to false, then the cursor is opened with its own connection and does not participate in any transactions started for the rest of the step processing. If you set this flag to true then you must wrap the DataSource in an ExtendedConnectionDataSourceProxy to prevent the connection from being closed and released after each commit. When you set this option to true, the statement used to open the cursor is created with both 'READ_ONLY' and 'HOLD_CURSORS_OVER_COMMIT' options. This allows holding the cursor open over transaction start and commits performed in the step processing. To use this feature, you need a database that supports this and a JDBC driver supporting JDBC 3.0 or later. Defaults to false. //For simplicity sake, assume sessionFactory already obtained. As a returned ResultSet (used by SQL Server, Sybase, DB2, Derby, and MySQL). As a ref-cursor returned as an out parameter (used by Oracle and PostgreSQL). As the return value of a stored function call. The preceding example relies on the stored procedure to provide a ResultSet as a returned result (option 1 from earlier). In all of these cases, we need to define a RowMapper as well as a DataSource and the actual procedure name. If the stored procedure or function takes in parameters, then they must be declared and set via the parameters property. The following example, for Oracle, declares three parameters. The first one is the out parameter that returns the ref-cursor, and the second and third are in parameters that takes a value of type INTEGER. In addition to the parameter declarations, we need to specify a PreparedStatementSetter implementation that sets the parameter values for the call. This works the same as for the JdbcCursorItemReader above. All the additional properties listed in Additional Properties apply to the StoredProcedureItemReader as well. An alternative to using a database cursor is running multiple queries where each query fetches a portion of the results. We refer to this portion as a page. Each query must specify the starting row number and the number of rows that we want returned in the page. One implementation of a paging ItemReader is the JdbcPagingItemReader. The JdbcPagingItemReader needs a PagingQueryProvider responsible for providing the SQL queries used to retrieve the rows making up a page. Since each database has its own strategy for providing paging support, we need to use a different PagingQueryProvider for each supported database type. There is also the SqlPagingQueryProviderFactoryBean that auto-detects the database that is being used and determine the appropriate PagingQueryProvider implementation. This simplifies the configuration and is the recommended best practice. The SqlPagingQueryProviderFactoryBean requires that you specify a select clause and a from clause. You can also provide an optional where clause. These clauses and the required sortKey are used to build an SQL statement. It is important to have a unique key constraint on the sortKey to guarantee that no data is lost between executions. After the reader has been opened, it passes back one item per call to read in the same basic fashion as any other ItemReader. The paging happens behind the scenes when additional rows are needed. This configured ItemReader returns CustomerCredit objects using the RowMapper, which must be specified. The 'pageSize' property determines the number of entities read from the database for each query run. The 'parameterValues' property can be used to specify a Map of parameter values for the query. If you use named parameters in the where clause, the key for each entry should match the name of the named parameter. If you use a traditional '?' placeholder, then the key for each entry should be the number of the placeholder, starting with 1. Another implementation of a paging ItemReader is the JpaPagingItemReader. JPA does not have a concept similar to the Hibernate StatelessSession, so we have to use other features provided by the JPA specification. Since JPA supports paging, this is a natural choice when it comes to using JPA for batch processing. After each page is read, the entities become detached and the persistence context is cleared, to allow the entities to be garbage collected once the page is processed. This configured ItemReader returns CustomerCredit objects in the exact same manner as described for the JdbcPagingItemReader above, assuming the CustomerCredit object has the correct JPA annotations or ORM mapping file. The 'pageSize' property determines the number of entities read from the database for each query execution. This is a common use case, especially when using Hibernate, and the simple guideline for implementations of ItemWriter is to flush on each call to write(). Doing so allows for items to be skipped reliably, with Spring Batch internally taking care of the granularity of the calls to ItemWriter after an error. + "from games, players where players.player_id ="
The ItemReader configured above does not make any entries in the ExecutionContext for any executions in which it participates. So far, this chapter has discussed the basic contracts of reading and writing in Spring Batch and some common implementations for doing so. However, these are all fairly generic, and there are many potential scenarios that may not be covered by out-of-the-box implementations. This section shows, by using a simple example, how to create a custom ItemReader and ItemWriter implementation and implement their contracts correctly. The ItemReader also implements ItemStream, in order to illustrate how to make a reader or writer restartable. The final challenge is to make the ItemReader restartable. Currently, if processing is interrupted and begins again, the ItemReader must start at the beginning. This is actually valid in many scenarios, but it is sometimes preferable that a batch job restarts where it left off. The key discriminant is often whether the reader is stateful or stateless. A stateless reader does not need to worry about restartability, but a stateful one has to try to reconstitute its last known state on restart. For this reason, we recommend that you keep custom readers stateless if possible, so you need not worry about restartability. Most ItemReaders have much more sophisticated restart logic. The JdbcCursorItemReader, for example, stores the row ID of the last processed row in the cursor. It is also worth noting that the key used within the ExecutionContext should not be trivial. That is because the same ExecutionContext is used for all ItemStreams within a Step. In most cases, simply prepending the key with the class name should be enough to guarantee uniqueness. However, in the rare cases where two of the same type of ItemStream are used in the same step (which can happen if two files are needed for output), a more unique name is needed. For this reason, many of the Spring Batch ItemReader and ItemWriter implementations have a setName() property that lets this key name be overridden. To make the ItemWriter restartable, we would follow the same process as for the ItemReader, adding and implementing the ItemStream interface to synchronize the execution context. In the example, we might have to count the number of items processed and add that as a footer record. If we needed to do that, we could implement ItemStream in our ItemWriter so that the counter was reconstituted from the execution context if the stream was re-opened. In many realistic cases, custom ItemWriters also delegate to another writer that itself is restartable (for example, when writing to a file), or else it writes to a transactional resource and so does not need to be restartable, because it is stateless. When you have a stateful writer you should probably be sure to implement ItemStream as well as ItemWriter. Remember also that the client of the writer needs to be aware of the ItemStream, so you may need to register it as a stream in the configuration. In this section, we will introduce you to readers and writers that have not already been discussed in the previous sections. In some cases, a user needs specialized behavior to be appended to a pre-existing ItemReader. Spring Batch offers some out of the box decorators that can add additional behavior to to your ItemReader and ItemWriter implementations. When using an ItemReader that is not thread safe, Spring Batch offers the SynchronizedItemStreamReader decorator, which can be used to make the ItemReader thread safe. Spring Batch provides a SynchronizedItemStreamReaderBuilder to construct an instance of the SynchronizedItemStreamReader. Spring Batch includes a decorator that adds a peek method to an ItemReader. This peek method lets the user peek one item ahead. Repeated calls to the peek returns the same item, and this is the next item returned from the read method. Spring Batch provides a SingleItemPeekableItemReaderBuilder to construct an instance of the SingleItemPeekableItemReader. SingleItemPeekableItemReader’s peek method is not thread-safe, because it would not be possible to honor the peek in multiple threads. Only one of the threads that peeked would get that item in the next call to read. The MultiResourceItemWriter wraps a ResourceAwareItemWriterItemStream and creates a new output resource when the count of items written in the current resource exceeds the itemCountLimitPerResource. Spring Batch provides a MultiResourceItemWriterBuilder to construct an instance of the MultiResourceItemWriter. The ClassifierCompositeItemWriter calls one of a collection of ItemWriter implementations for each item, based on a router pattern implemented through the provided Classifier. The implementation is thread-safe if all delegates are thread-safe. Spring Batch provides a ClassifierCompositeItemWriterBuilder to construct an instance of the ClassifierCompositeItemWriter. The ClassifierCompositeItemProcessor is an ItemProcessor that calls one of a collection of ItemProcessor implementations, based on a router pattern implemented through the provided Classifier. Spring Batch provides a ClassifierCompositeItemProcessorBuilder to construct an instance of the ClassifierCompositeItemProcessor. The AmqpItemReader is an ItemReader that uses an AmqpTemplate to receive or convert messages from an exchange. Spring Batch provides a AmqpItemReaderBuilder to construct an instance of the AmqpItemReader. The AmqpItemWriter is an ItemWriter that uses an AmqpTemplate to send messages to an AMQP exchange. Messages are sent to the nameless exchange if the name not specified in the provided AmqpTemplate. Spring Batch provides an AmqpItemWriterBuilder to construct an instance of the AmqpItemWriter. The JmsItemReader is an ItemReader for JMS that uses a JmsTemplate. The template should have a default destination, which is used to provide items for the read() method. Spring Batch provides a JmsItemReaderBuilder to construct an instance of the JmsItemReader. The JmsItemWriter is an ItemWriter for JMS that uses a JmsTemplate. The template should have a default destination, which is used to send items in write(List). Spring Batch provides a JmsItemWriterBuilder to construct an instance of the JmsItemWriter. The Neo4jItemReader is an ItemReader that reads objects from the graph database Neo4j by using a paging technique. Spring Batch provides a Neo4jItemReaderBuilder to construct an instance of the Neo4jItemReader. The MongoItemReader is an ItemReader that reads documents from MongoDB by using a paging technique. Spring Batch provides a MongoItemReaderBuilder to construct an instance of the MongoItemReader. The HibernateCursorItemReader is an ItemStreamReader for reading database records built on top of Hibernate. It executes the HQL query and then, when initialized, iterates over the result set as the read() method is called, successively returning an object corresponding to the current row. Spring Batch provides a HibernateCursorItemReaderBuilder to construct an instance of the HibernateCursorItemReader. The HibernatePagingItemReader is an ItemReader for reading database records built on top of Hibernate and reading only up to a fixed number of items at a time. Spring Batch provides a HibernatePagingItemReaderBuilder to construct an instance of the HibernatePagingItemReader. The RepositoryItemReader is an ItemReader that reads records by using a PagingAndSortingRepository. Spring Batch provides a RepositoryItemReaderBuilder to construct an instance of the RepositoryItemReader. The Neo4jItemWriter is an ItemWriter implementation that writes to a Neo4j database. Spring Batch provides a Neo4jItemWriterBuilder to construct an instance of the Neo4jItemWriter. The MongoItemWriter is an ItemWriter implementation that writes to a MongoDB store using an implementation of Spring Data’s MongoOperations. Spring Batch provides a MongoItemWriterBuilder to construct an instance of the MongoItemWriter. The RepositoryItemWriter is an ItemWriter wrapper for a CrudRepository from Spring Data. Spring Batch provides a RepositoryItemWriterBuilder to construct an instance of the RepositoryItemWriter. The HibernateItemWriter is an ItemWriter that uses a Hibernate session to save or update entities that are not part of the current Hibernate session. Spring Batch provides a HibernateItemWriterBuilder to construct an instance of the HibernateItemWriter. The JdbcBatchItemWriter is an ItemWriter that uses the batching features from NamedParameterJdbcTemplate to execute a batch of statements for all items provided. Spring Batch provides a JdbcBatchItemWriterBuilder to construct an instance of the JdbcBatchItemWriter. The JpaItemWriter is an ItemWriter that uses a JPA EntityManagerFactory to merge any entities that are not part of the persistence context. Spring Batch provides a JpaItemWriterBuilder to construct an instance of the JpaItemWriter. The GemfireItemWriter is an ItemWriter that uses a GemfireTemplate that stores items in GemFire as key/value pairs. Spring Batch provides a GemfireItemWriterBuilder to construct an instance of the GemfireItemWriter. The LdifReader reads LDIF (LDAP Data Interchange Format) records from a Resource, parses them, and returns a LdapAttribute object for each read executed. Spring Batch provides a LdifReaderBuilder to construct an instance of the LdifReader. The MappingLdifReader reads LDIF (LDAP Data Interchange Format) records from a Resource, parses them then maps each LDIF record to a POJO (Plain Old Java Object). Each read returns a POJO. Spring Batch provides a MappingLdifReaderBuilder to construct an instance of the MappingLdifReader. The SimpleMailMessageItemWriter is an ItemWriter that can send mail messages. It delegates the actual sending of messages to an instance of MailSender. Spring Batch provides a SimpleMailMessageItemWriterBuilder to construct an instance of the SimpleMailMessageItemWriter. The ScriptItemProcessor is an ItemProcessor that passes the current item to process to the provided script and the result of the script is returned by the processor. Spring Batch provides a ScriptItemProcessorBuilder to construct an instance of the ScriptItemProcessor.